This session was organized by the “MARKETING CLUB” on 20th Feb, 2016. The purpose of the session was to give an overview of various aspects in the field of marketing with respect to "specialization, selection & career". The session was conducted by JIMS’ alumnus, Mr. Abhishek bhambani student of PGDM marketing from batch 2006-08, presently working as product manager at Future Brands with a hand on experience of 7 years in the field of Masstige Skin Care, Personal Care & Cosmetics industry. Various aspects in the field of marketing were discussed with the students, aspiring for career in marketing. 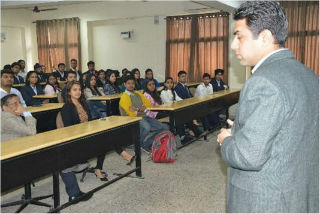 Mr.Abhishek provided overview of various job profiles and companies offering those profiles. 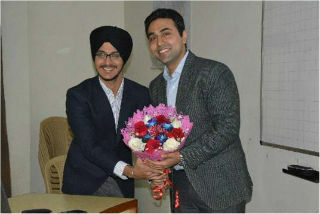 He also gave tips on how to excel in the field of marketing and shared his journey of 7 years in this area. He discussed the various challenges faced by him and how he overcame those issues as well as his key learning’s in 7 years of corporate career. •Key players in different field of marketing. •Different job profiles in the field of marketing. •Some books were also suggested by him on the topics like social, cultural and mythological issues in marketing. Students also actively participated and asked various questions regarding selection of specialisation and field they should go for in marketing. He also responded to the queries related to finance as major and marketing as minor specializations. The session was quiet helpful and knowledgeable and appreciated by the participants.